It may be old, but it is most certainly not garbage… The Millennium Falcon is about as iconic as your Star Wars ships get. 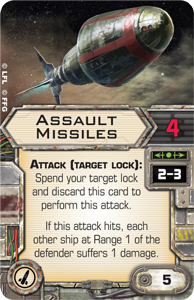 It is also one of the two ships featured in the Heroes of the Resistance Expansion Pack for X-Wing™. 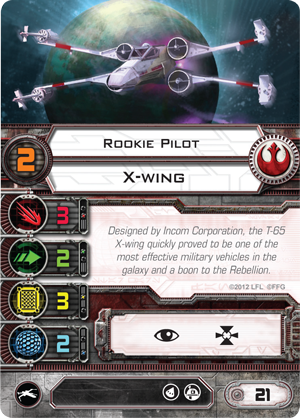 Like all the other "aces" expansions for X-Wing, Heroes of the Resistance revisits one or more of the ships already in the game—two, in this case—and updates them with new miniatures, ship cards, and upgrades. The result is an expansion that feels deeply rooted within the game's core, but that pushes its ships into fantastic new territory. 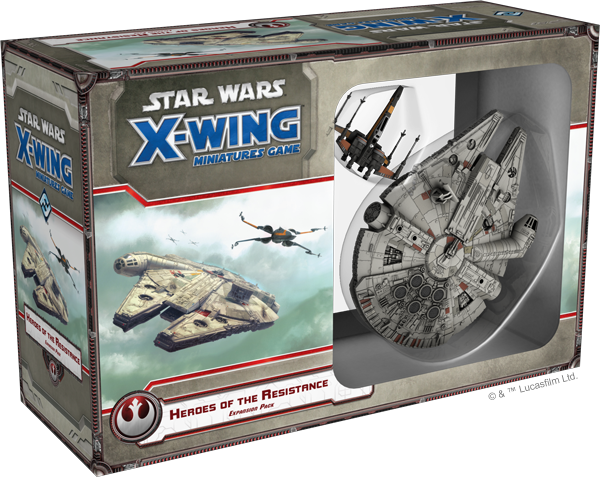 Accordingly, with Heroes of the Resistance, we find new miniatures and options for the Millennium Falcon and T-70 X-wing that guarantee they will soon find their way into some of the most creative, most competitive, and best-looking squads soon to hit tables everywhere! 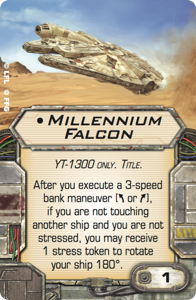 Today, we begin to explore these options with a look at the Millennium Falcon, its new ship cards, its new Title card, and several of the other upgrades from Heroes of the Resistance that help it make the jump from the classic trilogy era to the age of The Force Awakens. The Millennium Falcon is arguably the most iconic starship in the Star Wars galaxy. That said, the ship has changed. Most notably, Lando Calrissian snapped off the ship's circular sensor array during his attack run on the second Death Star, and the Falcon was subsequently outfitted with a rectangular sensor array. More importantly, it found a talented new pilot. "At this point I've designed, made at size in plastic, dozens of ships for X-Wing and Star Wars™: Armada, and people sometimes ask me what's my favorite ship. I'll think about it for a second so they know they're getting their money's worth, but the answer is always the Millennium Falcon. It was the first ship I designed for X-Wing. "When I worked on that first X-Wing Falcon, all I had to base my design off of were the movies and some production photos of the original models. Anything that wasn't clear had to be inferred. With the new Falcon, we had very clear orthographic renders of the 3D model from Lucasfilm. This meant we could perform a definitive comparison of our original Falcon and the model from The Force Awakens, and we decided there were enough differences in the detail and paint application that it warranted creating new molds and paint tools. "The most interesting part for me is not the obvious detail—the rectangular dish—but the small details. I wasn't aware until I had started modeling the Falcon the first time that they had rebuilt the model for each movie. I think most fans think of the Falcon as not just iconic, but singular, yet the smaller details actually change from movie to movie. Finding the differences, the things that most people would never notice—a lot of these details only come out if you spend hours a day poring over details while painstakingly trying to recreate those details as faithfully as possible at 1/270th scale for plastic production. "The new Falcon is not just a more uniform design. It also breaks a mold within the X-Wing line; it is the first ship to feature an engine glow. Early on we decided not to paint engine glow on ships in X-Wing. We were concerned the effect wouldn't always translate well, and it might be weird for some ships to have glow and some not. However, the Falcon is and has always been something special. Updating it for The Force Awakens gave us another chance to ask ourselves whether or not it should have an engine glow, and we felt the glow and the extra detail visible in the engine area was just too important not to represent." "I stole it. From Unkar Plutt. He stole it from the Irving Boys, who stole it from Ducain." "Who stole it from me! Well, you tell him that Han Solo just stole back the Millennium Falcon for good." By the time of The Force Awakens, the Millennium Falcon has changed ownership a number of times. Nonetheless, it remains the uniquely modified light freighter that famously made the Kessel Run in under twelve parsecs. This means that in Heroes of the Resistance, we get new ship cards to represent its pilots, even as we get some new upgrades that help us better appreciate the ways Han Solo had the ship outfitted in his smuggling days. Of course, the first new pilot is Rey, the heroine of The Force Awakens. 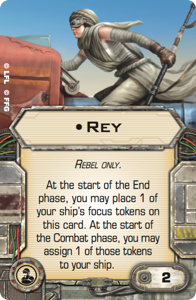 We already revealed her ship card in our announcement of the Heroes of the Resistance Expansion Pack, but Rey is worth revisiting so that we can better understand the direction in which her ship card, the new Millennium Falcon Title upgrade, and the expansion as a whole are poised to take us. Whenever she is attacking or defending against a ship within her firing arc, Rey can reroll up to two of her blank results. Naturally, this makes her a tremendously consistent attacker against ships within her firing arc as it serves a similar role as a free target lock. Instead of needing to spend an action to acquire a target lock, Rey merely needs to keep her enemy within her firing arc, and the new Millennium Falcon Title goes a long way to ensure that she does. On the defense, her ability would appear less impactful. 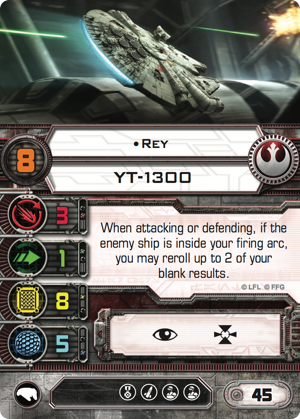 After all, the Falcon only boasts a single point of agility, meaning Rey only gets to roll two defense dice if she stays back at Range "3" of her opponent or manages to force her foe to take an obstructed attack. At least, this is is the case until Rey gains the support of Finn. 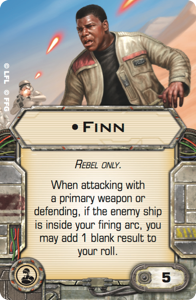 As a crew upgrade, Finn adds a blank die result to any primary weapon attack made against a ship within your firing arc or to any defense roll against a ship within your firing arc. You will notice, here, that Finn's "within your firing arc" requirement lines up perfectly with Rey's ability. There may be other places where Finn will shine, but the two were made to work together, and just like in the movie, they make each other better. Rey and Finn are not the only characters to come with strong thematic ties to their cinematic portrayal. The new ship card for Chewbacca plays to the sort of Wookiee rage he exhibits toward the end of the film. Whenever he loses a wingmate at Range 1–3, Chewbacca gains the ability to perform an immediate attack. Naturally, Chewbacca's ability allows him to retaliate whenever your opponent destroys one of your ships, but it might also play into some more desperate strategies, as well. For example, one could imagine seeing Chewbacca partnered with a number of Bandit Squadron Pilots. 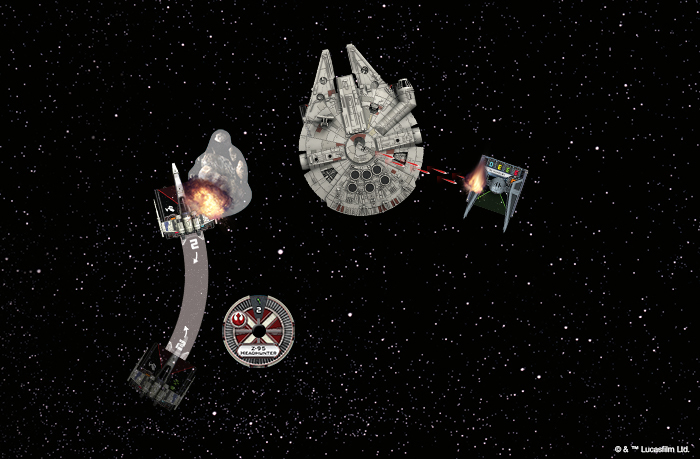 Not only would these point-efficient ships offer Chewbacca more opportunities to trigger his ability, they would perform their maneuvers early enough in the activation phase that if one were to "accidentally" crash into an asteroid and explode, it might buy Chewbacca a chance to take a shot at an Imperial ace like Soontir Fel before Fel could maneuver or load up with focus and evade tokens. 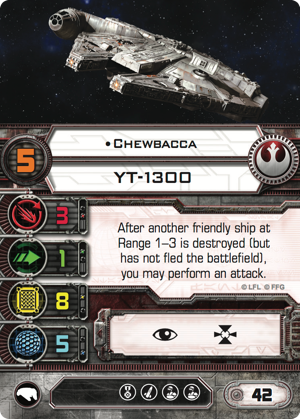 Immediately after his Bandit Squadron Pilot wingmate crashes into an asteroid, Chewbacca is able to take a shot at Soontir Fel—before Fel is able to maneuver and load up with defensive tokens. Nonetheless, despite all of Chewbacca's familiarity with the Falcon and all the tricks permitted by his new pilot ability, there is no pilot more closely associated with the ship than the notorious smuggler, scoundrel, and former war hero Han Solo. It makes sense; Han was, after all, the one who outfitted the Falcon with her special modifications. And even though he has aged by the time of The Force Awakens, he can still fly with the best of them. "This is the Millennium Falcon? You're Han Solo?" 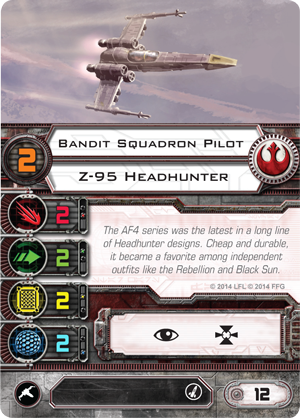 In the Heroes of the Resistance Expansion Pack, Han Solo retains his pilot skill value of "9," but his unique pilot talent is radically revised. By the time of The Force Awakens, Han has aged, and though he still flies with confidence and daring, his tricks have changed. 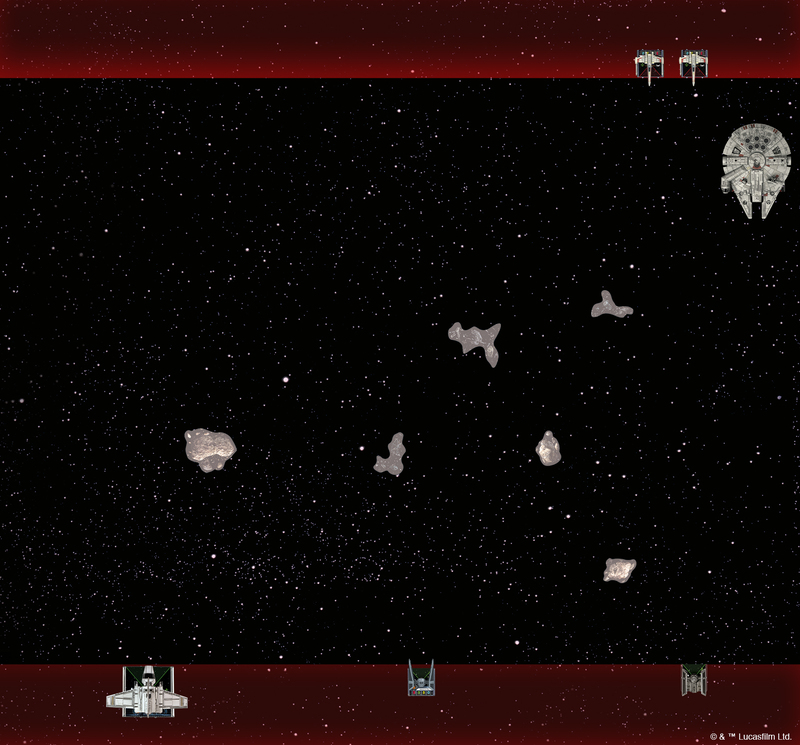 Instead of shooting from the hip and weaving through asteroid fields, Han is now slipping past enemy shields by making his landing approaches at lightspeed. "When you are placed during setup, you can be placed anywhere in the play area beyond Range 3 of enemy ships." It is important, here, to remember that Han's pilot skill value of "9" means that he will be placed after nearly every other ship in the game. If you build your squad at fewer than 100 points, in order to win the bid for initiative, you can even place Han after your opponent's ships with pilot skill values of "9." 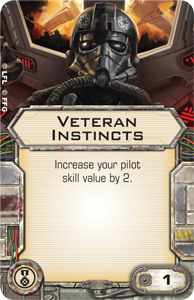 Alternatively, you can raise his pilot skill value to "11" with the elite pilot talent, Veteran Instincts , so that you can be certain to place him after your opponent places all their pilot skill "9" aces. What does this do for you? Well, for starters, it can allow you to fly Han into battle on the first turn. 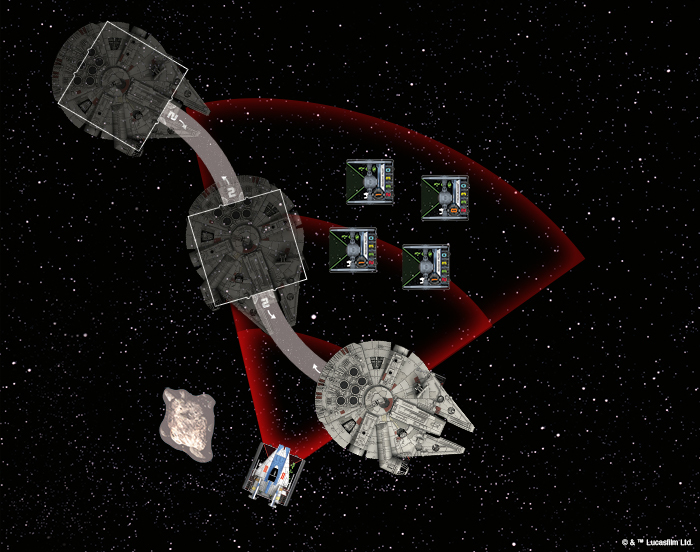 In this example, Han Solo sets up in position to chase Soontir Fel, forcing the Imperial player to either turn and face Han in the first round, or to flee, hoping to outpace the Millennium Falcon. 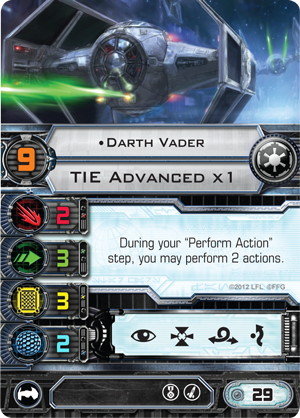 More importantly, Han's ability forces your opponent to anticipate Han's deployment. Since there is no telling where Han may first arrive on the map, your opponent may try to spread out in order to deny Han an early flanking position. 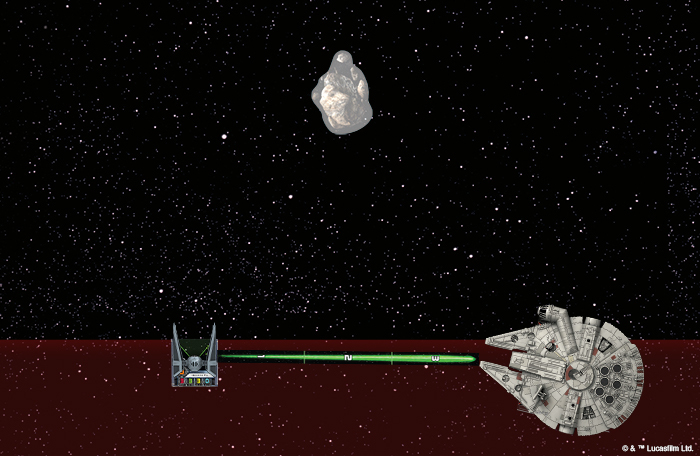 In this example, the Imperial player deploys Soontir Fel, Darth Vader, and Emperor Palpatine's Lambda-class shuttle far away from each other in order to prevent Han Solo from deploying in an immediate flank. 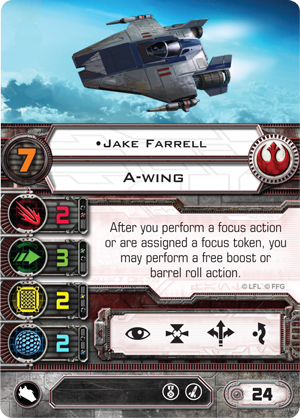 However, it allows the Rebel player to deploy Han alongside his Rookie Pilot wingmates so that they can better concentrate fire on a single target. Finally, you might not even use Han Solo's unique deployment in order to gain an advantage in the early rounds. You might use him to draw your opponents into a trap, leaving them even more vulnerable in later rounds. 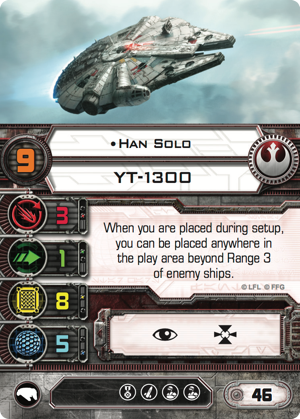 Once you deploy Han Solo, especially if your opponent keeps his squad in tight formation, you run the risk that your opponent will attempt to isolate him the way you might have hoped to isolate a single ship. Instead of getting in behind a single TIE fighter, Han might find himself flying straight at a whole TIE squadron. But that would not be the first time Han has found himself in such a situation. 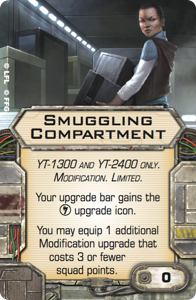 He has evaded TIE fighters on multiple occasions, and the Heroes of the Resistance Expansion Pack allows him to make use of the illicit technologies he can load onto the Falcon with the new Smuggling Compartment modification. One of these is the Burnout Slam upgrade. 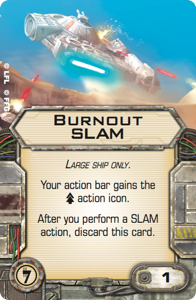 Although performing a SLAM leaves you unable to attack for the remainder of the round, and although you need to discard your Burnout Slam after you use it, the difference between facing a TIE swarm and SLAMing past it could very well prove the difference between victory and defeat. 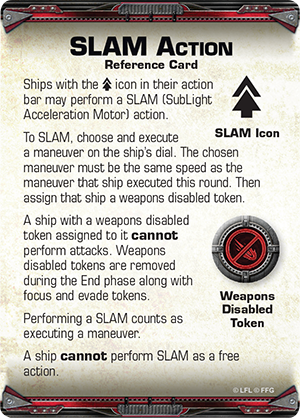 Especially if you can use Han Solo and your SLAM as part of an early tactic to lure your opponents into position where your other ships can get good, free shots at them. 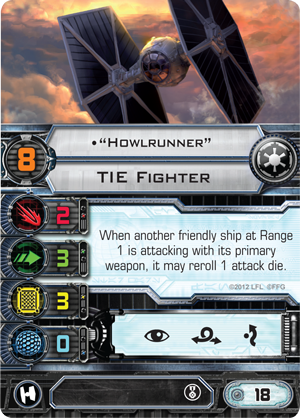 After he SLAMs past the Imperial player's TIE fighters, Han Solo is no longer at risk of being shot, but "Howlrunner" and the TIE swarm that had hoped to catch Han now find themselves exposed to Jake Farrell's Assault Missiles . "I've been thinkin' about bringing on some more crew, Rey. A second mate. Someone to help out. Someone who can keep up with Chewie and me, appreciates the Falcon." 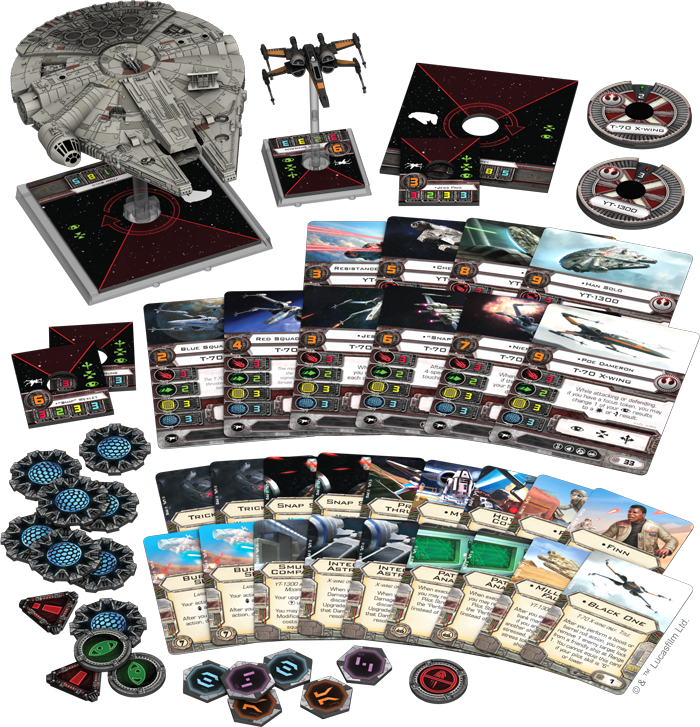 The ship is the same, but with all the new ship cards and upgrades it gains in the Heroes of the Resistance Expansion Pack, the Millennium Falcon explores some exciting new X-Wing territory. What will you do with its new pilots? Where will you deploy Han Solo? How will you outfit the Falcon you have Rey pilot? How will you outfit the Falcon that Rey joins as a crew member? The possibilities are boundless, and we invite you to share your thoughts on our community forums. 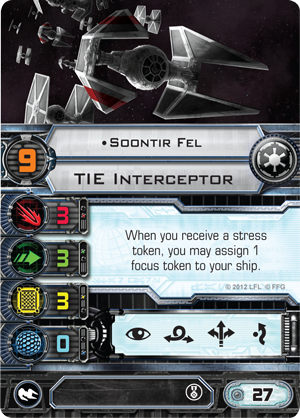 Then stay tuned for our look at Poe Dameron's Black One and the new T-70 X-wing pilots!